Barney the Dinosaur joined the list of attractions at the beginning of 2000. One of the new attractions was "Barney's Playground" - a soft play area for the children. 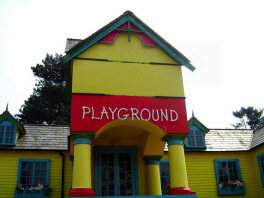 When the Tweenies replaced Barney in 2003, the attraction was renamed "Tweenies Playground". The Tweenies contract finished at the end of 2005, and the attraction was renamed Cred Street Playground. The playground mostly consists of inflatable play areas, and ball pools to keep the kids amused for an hour or so. A café is close by, so the adults can have a relaxing drink or ice-cream, while keeping a close eye on their offspring.